There is something enchanted about Loris Gréaud’s Gunpowder Forest Bubble (currently installed in Palazzo Grassi as part of the exhibition The World Belongs to You). 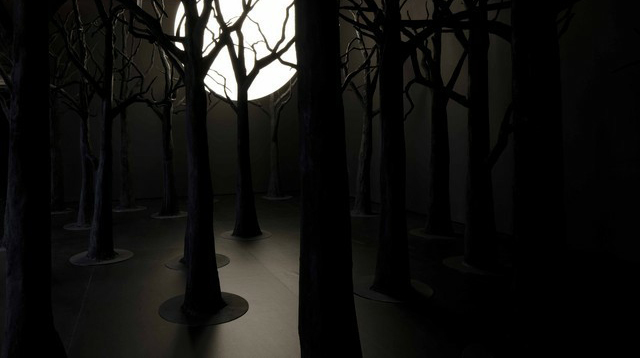 By the light the moon, which hangs low in the shadowy forest, I can see that I am alone. The trees are bare and dark; they loom above me. There is a sense of theatre about the installation, albeit without a predetermined narrative. This is the forest as a fairytale space where anything is possible, and anything – perhaps especially – danger might be revealed. And there is danger here, notionally at least, for the stark carbonised trees are coated in gunpowder. Rationally I might know that the risk is minimal to non-existent, but still: gunpowder! That hardly seems safe. Though this is first time I have seen Gunpowder Forest Bubble, my feeling is that it gains from being in what is essentially a large group show in which each artist has a room of their own. Finding this world unexpectedly made me exclaim out loud and I think I may have jumped when my solitary wander through the forest was disrupted by an invigilator passing through the installation. Palazzo Grassi is a very particular gallery space though: an unusual combination of Venetian palace and contemporary art museum; here all the attributes of the modernist white cube space meet the ornate interiors of eighteenth century Venice. The installation occupies both of these well (though the walls here are black) and benefits from both aspects of the space. The ornate ceiling provides an unusual sky and the windows overlooking the Grand Canal offer an unexpected view beyond the forest. We can see our way through to a different, but no less theatrical, world. The World Belongs to You is at Palazzo Grassi until 21 February 2012. Maybe. According to this it ended last December which makes me wonder whether I dreamed the whole thing. Spooky. 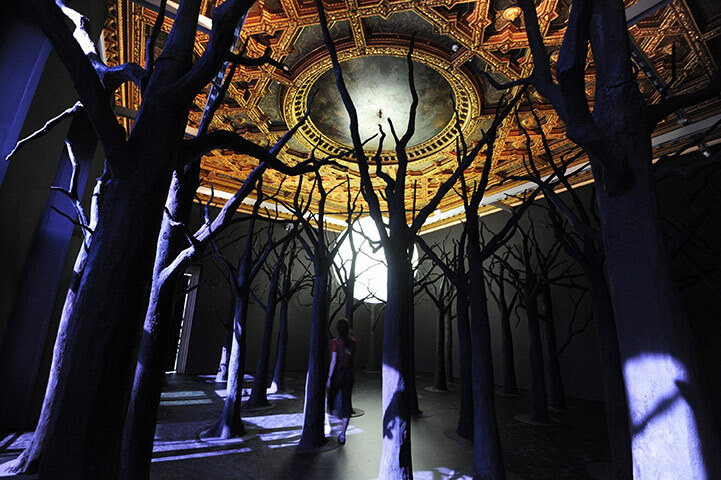 This entry was posted in Installation, Sculpture and tagged art, forest, Gunpowder Forest Bubble, installation, Loris Gréaud, Palazzo Grassi, sculpture, Venice by Ann Jones. Bookmark the permalink.